Welcome to the fifth RoadToBio newsletter. Our roadmap for increasing the bio-based portfolio and improving the sustainability of the European chemical industry is already shaping up. In this newsletter we present a short summary of our first webinar “The best of two worlds – making chemistry more bio-based”, which was held on 7 February 2018. After a short introduction about the necessity of the transition from a fossil based to a more bio-based chemical industry, a classification system for bio-based chemicals with regard to their entry point into existing chemical value chains was presented. The third and final part showed the results of the initial RoadToBio study which aimed to identify and to discuss specific “Bio-based opportunities for the chemical industry”. ­ In 2005 the European Commission published a framework programme to define the main goals and an action plan to support the European bioeconomy for the first time. While originally the substitution of limited and expensive fossil raw materials was a major driver for the transformation, today sustainability considerations are at the core of the efforts for a more bio-based economy. The latest catchphrase heard in this context is “biologisation”, which can mean two different things: Using biotechnological processes and/or using biomass as a resource. Both can, but don’t necessarily have to, go hand in hand. Bio-based smart drop-ins are a subset of drop-ins, which have two or more of the following characteristics: high biomass utilisation efficiency, low energy use in their production, short or less complex production pathway, and/or fewer toxic chemicals used in their production and enter existing fossil chemical value chain at a later stage. As a consequence, smart drop-ins will usually be commodities of smaller volume compared to normal drop-ins. 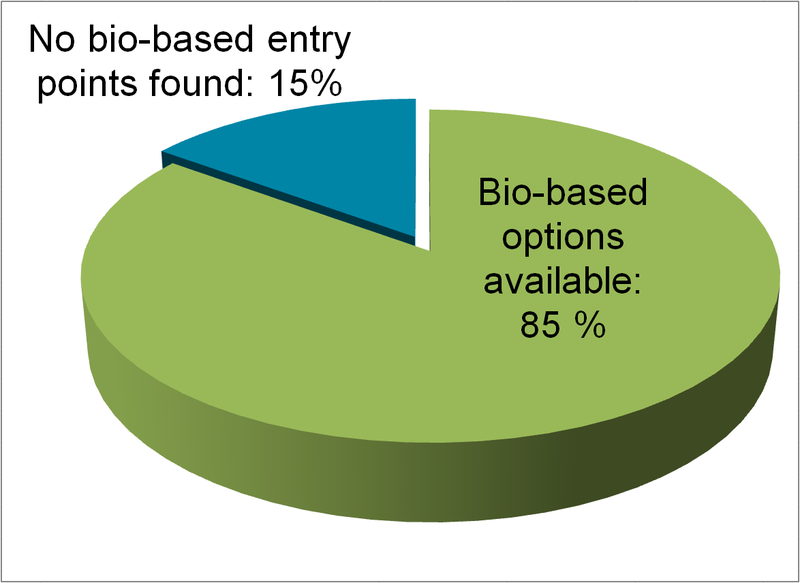 In one of the first RoadToBio studies more than 500 petrochemical value chains in nine different product groups were analysed, which showed more than 1,000 entry points for bio-based chemicals. For 85 % of the existing petrochemicals, at least one bio-based route was found that is available at either demonstration or commercial scale. ­ This study provides the knowledge base for the subsequent activities in the project, notably an assessment of the barriers as well as the most promising opportunities, and nine specific business case studies, which will together inform the roadmap for the chemical industry. More specifically, the next step will be to rank the identified matching chemicals with regard to market volumes, implementation feasibility and growth potential. Join us on the journey to a more bio-based chemical industry and participate in our stakeholder workshops and webinars. Our next stakeholder workshop is scheduled to be held on 19 June 2018 in Brussels. ­ Previously in the project identified opportunities to introduce bio-based chemicals into existing fossil-based process chains are shown and the definitions presented here are applied directly to practical examples. Do not miss the next newsletter.